As a genre, funk never died – it permeates the DNA of everything hip-shaking, sweaty, and righteous in American culture – but it has ebbs and flows. 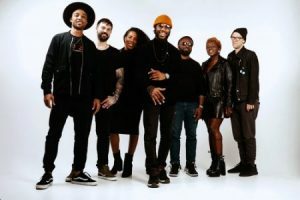 In this current moment, there may be no better practitioner of the age-old art than bandleader, singer, songwriter and keyboardist Cory Henry, solo or with his Funk Apostles. He and the band ride the joyous wave of their stellar new album, Art of Love, to Columbus for a September 11 gig at Skully’s (tickets available here). Videos and discussion of the show are below. Cory Henry grew up in the church – there are YouTube videos of him playing the organ as a tiny child – and he’s grown into one of our finest organ players. His language fuses the rich, communicative intensity of gospel with a searching imagination and limitless creativity. First gaining notice with Snarky Puppy (and in the touring bands of artists as wide-ranging as Donnie McClurkin, Kenny Garrett, and Sara Bareilles), Henry’s spent the last few years refining his voice as a composer and leader. Each of the records under his name bore witness to this process and each is a little sharper, more distinct. Art of Love takes the elements that make him a fascinating artist and uses them as jet fuel. I saw Cory Henry and the Funk Apostles this Spring in Paris; a packed show at the historic Le Trianon venue. No one stopped moving for the entire 90 minutes they were on stage. Like every great bandleader, Henry believed in himself and his team enough to let every member shine. The unit stretched songs and vamps out into uncharted territory without falling into slack jam-band clichés. Every tune walked the line and exploited that sweet tension in coming together and falling apart, dark-hearted duende wrapped in a glowing love for the world. Henry has a fascinating knack for arranging covers. Two from that show stand out in my mind. The band did the Bee Gees classic “Stayin’ Alive” like they were sneaking up on it. Teasing out the chords until that classic, slinky riff snapped into place. And as they milked that groove everybody grew up with, they slowly turned up the melancholy. When they got to the bridge, “Life’s going nowhere. Somebody help me. Somebody help me, please,” Those lines lifted me up and slammed me back like a climactic aria. At a third (maybe) the length, they came out for an encore butting right up against curfew. Henry said, “We’ve got three minutes, can we play something?” And before the cheers faded, they bore down into a version of Prince’s “Controversy” that would have even made the regal one raise an eyebrow. One of the best shows I’ve seen this year and something I couldn’t be happier to see again. Don’t we all need some of that joy in our lives?